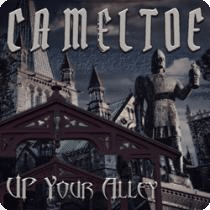 Cameltoe, the name is hilarious, the music is top notch. Starting with Delusional the band is treated to a solid riff that gets the listener moving, the vocals are on point and things are looking good. Screaming My Head Off continues where Delusional left off, big riffs, brilliant vocals and a solid rhythm section, that keeps things going, a brilliant song. Never What It Seems has echoes of eighties Dokken, something of a Paris is Burning, In My Dreams feel to it, and Vocalist Ben Rodgers delivers a brilliant performance. Tank Commander is epic, big vocals, big choruses, everything is big and that is what makes the music so good. I Always Cared is a lament, fit for the 21st Century, soft, sharp, to the point, brilliantly executed. Twisted Fister is a mix of a call to arms and a banger of a rock song, the guitars truly sing out on this song and make it seem perfect. Coming Home is another tribute to the journey of a rock band and their desires to return to where they come from, a brilliant song and tribute. Devil’s Soul is haunting, dark, and melodic all at once. Rocky Road begins acoustically and continues, building anticipation before building to the crescendo at the end. Spread My Wings is dark, haunting and shows off Ben Rodgers vocal talents, as well as the skills of the guitarists Aune and Bakken. A brilliant closer to the album. Be sure to get this masterpiece via Battleground Productions.